An invitation to taste the wares of nine Massachusetts wineries catches our eye. But it's the promise of warmth that seals the deal. "Shoppers enjoy being in a warm greenhouse setting on a cold winter's day," enthused farmer's market manager Peg Mallett in a recent email. 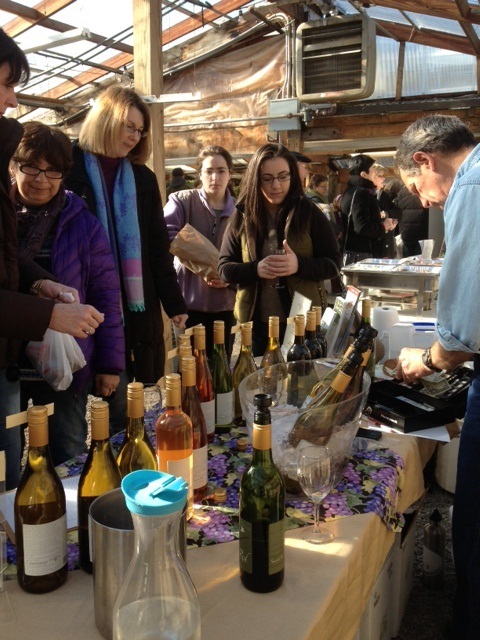 Envisioning sips of local wine among potted violets, food vendors and a cornucopia of root vegetables, we headed out last Saturday to Massachusetts Farm Wineries Day at the Wayland Winter Farmers' Market. This winter market, one of the forty operating this time of year throughout the state, is truly special. Held at Russell's Garden Center on Boston Post Road, the greenhouse environment -- a warren of farm vendors, bakeries and purveyors of jams and salsas -- allows us to shed our bulky coats soon after arriving. The nine wineries, from north and south of Boston as well as Central and Western Mass, are doing brisk business. Customers sample half-ounce pours, purchase bottles for dinner, and chat with winemakers like Donna Martin of Mill River Winery in Rowley. She affirms the importance of a 2010 Massachusetts law allowing farm wineries to sell at farmers' markets and agricultural events. Martin talks about the law as a catalyst for growth -- not only for her winery, but for nearly forty others in the Bay State. Wineries participating in a 2011 survey conducted by the Massachusetts Department of Agricultural Resources reported doing more than $500,0000 in wine sales that year, an average overall sales increase per winery of 66 percent over previous years. These oft-repeated figures underscore how the law helps increase business and raise the visibility of these wineries among Massachusetts wine consumers, whose per capita wine consumption is double the national average. 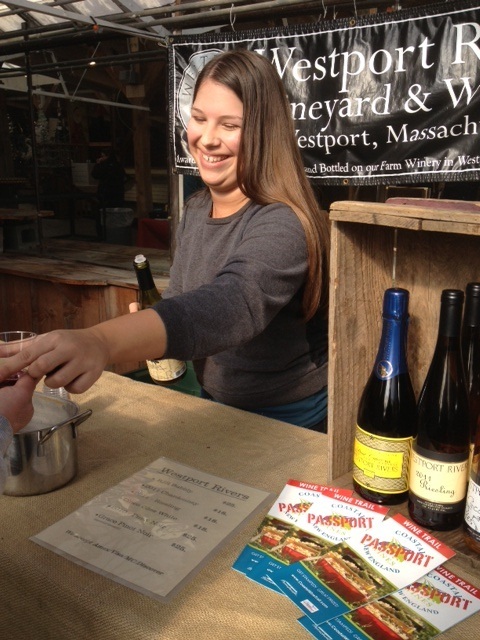 Trudi Perry, winemaker of Alfalfa Farm Winery in Topsfield loves selling her wines at farmers' markets. She observes that some towns are reluctant to allow wine sales at events like these. (The law requires the approval of the local jurisdiction.) Are some towns afraid that selling wine will attract a bad element? Scanning market goers, many relaxing at patio tables set up among the lush plants, nibbling on grilled cheese and tomato soup, it's hard to imagine rowdy behavior from this bunch. All we see are contented folk, happy for the chance to feel cozy on a January day. Realizing that this greenhouse-turned-winter market lasts only until March 9th, we reconnect with Peg Mallett. "I tried to get permission to extend the season by one week," she says, "but the growing of annual flowers has to stay on schedule." For more information about local wine events, check out the calendar of the Massachusetts Farm Wineries & Growers Association and the newly redesigned Wine & Cheese Trails guide. 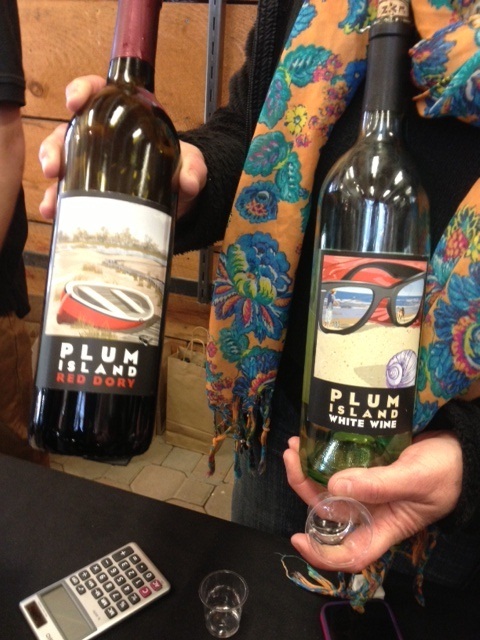 Photo, top left: Wine tasters at the table of Coastal Vineyards, South Dartmouth. David Neilson, owner and winemaker, on the right. Photo, middle right: Wines from Mill River Winery, Rowley, held by owner/winemaker Donna Martin. Photo, bottom right: Liz Koczera of Westport Rivers, Westport. The 2006 RJR Brut (first bottle to her left) has a newly designed yellow label.